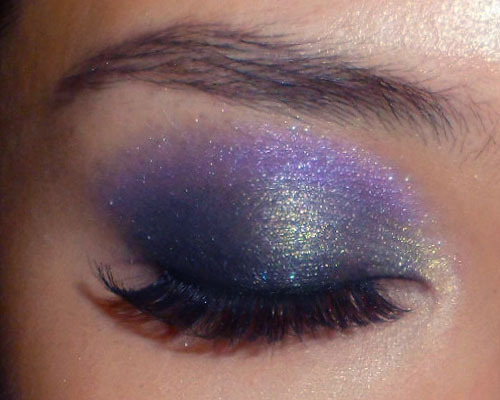 A smoky eye and false lashes do not necessarily mean a heavy look if you layer on some shine and subtle color. Step 1: Apply the black base in an even layer, sheering out above the socket line. Step 2: Dab the tips of a brush into black shadow and then pack it gently along the lash line. Don't run this over the entire crease area as you need to leave space for the silver-gold. Step 3: With the silvery-gold shade in the Wet n Wild palette (or any soft grey you have), run just above the black shadow in a thin strip. You may need to go over a couple of times to build up intensity. Try to keep the color within the socket line. 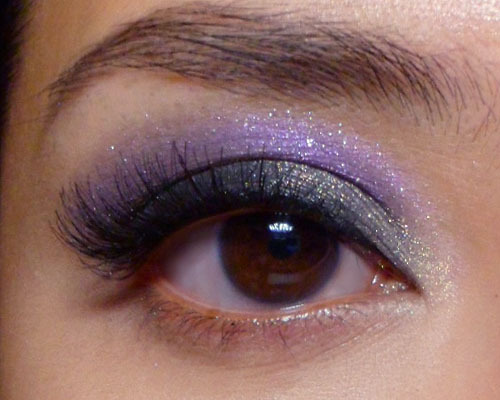 Step 4: Run a sparkly purple along the socket line, framing the rest of the eye makeup. You can smoke this color out a bit more since it's the outermost shade. Step 5: Apply black liquid liner at the base of your upper lashes, and then apply wispy false lashes. To keep the look lighter and more lifted upwards, I'm not applying anything on the bottom lash line. Not even mascara. Your tutorials are so good and even help others feel less intimidated to use bold colors. Thank you! Can't wait to try this on a night out. Hope you have fun with the look!